Hosted by the University of Arizona library, this clearinghouse offers access to diverse sites related to paleontology and fossils. Categories include: associations, clubs and societies; bibliographies; careers and employment; courses; collections and collection catalogs; colleges and universities; commercial and companies; computers and mathematical modeling; dinosaurs; evolution and extinction; fossil collecting: guidelines, laws, legislations, and policies; geographic, regional, and localities; geologic ages and formations; ichnology/trace fossils; invertebrates; K-12 level of interest; listserves, newsgroups and bulletin boards; museums and museum exhibits; paleobotany and palynology; paleoclimatology and paleoecology; periodical publications; research centers, groups and institutes; researchers and collectors; state fossils; taxonomy and systematics; television programs; trilobites; and vertebrates. In addition, there are several guides, bibliographies, and indexes written by the author to aid researchers in finding information in the University of Arizona Libraries. 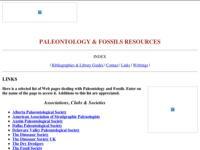 This web site is part of the Paleo (web) Ring.